I'm trying something a little new in 2018. Instead of 365 Project posts, every Friday I'll post some fun links and feature things to do, along with an illustration from my super talented friend Lindsey. Lindsey is "dedicated to keeping a visual and written sketchbook about eating and traveling in New York City and abroad" and I love discovering new parts of the city through her illustrations. 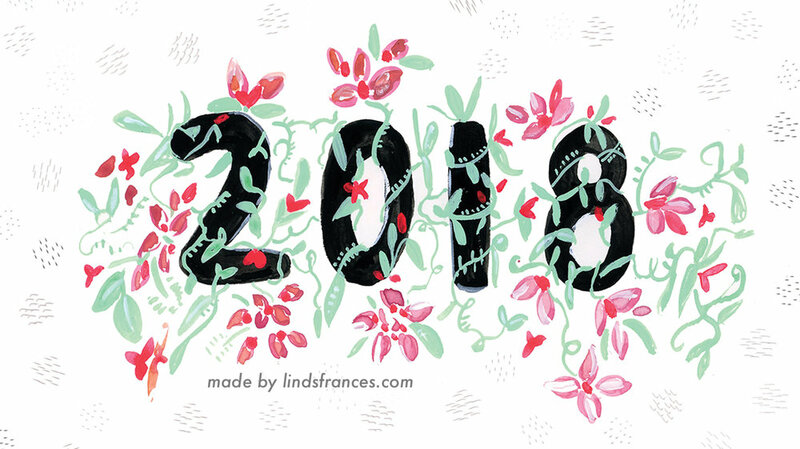 She made this lovely 2018 calendar, and you can download it here for free (and hire her for commissions!). Guy Fieri's "no-star" restaurant in Times Square has closed after five years. We went last year, and let me just say that I'm not at all surprised that it closed, but I'm definitely surprised that it lasted five years after this infamous review. On Monday night, there was a major fire at the diner my mom and frequent. It's been in business for over 50 years and we just had breakfast there on New Year's Eve. I'm hoping for a speedy recovery but I'm also nervous because classic diners like this are an endangered species here in the city. Do you make New Year's resolutions? I don't really, but I love reading about how to actually make realistic changes to your life—this article has a lot of great tips on how to start. The No Pants Subway Ride is still going on despite the bone-chilling cold (posting this information not so you can do this, but actively avoid it). The Holiday Train Show is still going on at the NYBG until January 15th. I didn't go this year, but here are my photos from 2014 and 2013. This is the last weekend for the Volez, Voguez, Voyagez Louis Vuitton exhibit. It's at the American Stock Exchange building and admission is free (online reservation required). Through an Instagram rabbit-hole I discovered the incredible work of Laura Plansker and immediately bought one of her handmade salami ornaments. I also discovered this Instagram account called UnsolvedMysteriesPeople—which is exactly what it sounds like—and it's so good. I bought these shoes a few weeks ago after searching for years for a "sneaker rain boot" and they're not warm enough to wear in these arctic temps but they're so comfortable and for the first time in my life I'm actually looking forward to rain. I have no plans for this weekend, mostly because Saturday is supposed to be a high of 10 degrees. I love winter in the city (especially all of the snow we've had so far!) but this extended cold snap has really zapped me of any desire to do anything except sit under blankets and watch movies. It looks like we'll be back to somewhat normal temps next week (in the 30s), but until then a diner breakfast is probably all I'll be able to manage. My mom and I have decided that it is our civic duty to patronize a local diner every week, and we're doing a pretty good job of keeping that promise. I hope you have a great weekend, and if it's cold where you are stay warm!